The Hang Loose Santa Catarina Pro (the same event usually held each November as a precursor to the Pipeline Masters) already has it’s first two rounds in the books. To avoid a repeat of last year’s debacle, the ASP moved the Hang Loose Pro to June in order to ensure the attendance of the top talent on tour, the surfers that people actually care about seeing surf. After last year’s event saw 13 out of the ASP’s Top 44 surfers fail to show due to a remarkable array of injuries and illnesses, all that was left was another beach-break championship with 20 of the 48 competitors hailing from the host country. The thinking was that with a world title still very much up for grabs, anyone remotely in contention will do their best to avoid the unfortunate happenings that kept so many from making the trip to Florianopolis in ‘08. It worked, everyone showed up and the ‘Loose Pro has itself a full line-up of some of the world’s best surfers. There’s just one problem though- It’s still Brazil. They call it the “Dream Tour”, yet I’m a bit curious to know whose dreams the ASP is modeling this thing after. After sitting through a few moments of the ‘Loose Pro webcast, it was time to click away and wait for J-Bay. Nothing more to see here. Despite what some might say, there’s room in this world for a competitive surfing tour. Watching the surfers at the top of the game pushing themselves and each other live from the best waves throughout the world isn’t just entertaining, it also puts the ‘what’s possible’ element on display for all to see. There needs to be standards though, uncompromised standards. The answer for what’s ailing the ASP World Tour won’t be found in futuristic wave pools, it won’t be found in Brazil, it will be found in simplicity. Fewer surfers, better waves, no Brazil. Entering the 2009 year on the ASP World Tour sans a major sponsor probably isn’t something Bobby Martinez ever anticipated taking place. However, when a well-publicized contract dispute with longtime sponsor Reef sent the two their separate ways, that’s exactly where the Santa Barbara, Ca. surfer found himself. Driven to once again prove himself as one of the top all-around surfers in the world, sponsored or not, Bobby Martinez claimed another WCT victory at Teahupo’o yesterday by beating out Taj Burrow to win the 2009 Billabong Pro Tahiti. 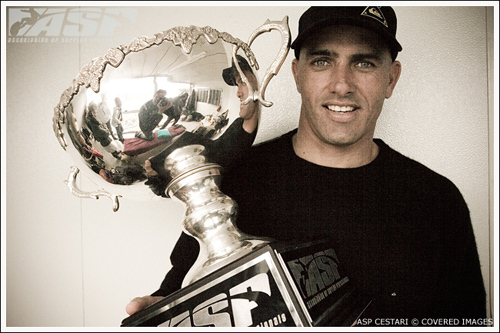 A huge congratulations goes out to Bobby Martinez- winner of the 2009 Billabong Pro Tahiti. *On a side note- I’d also like to thank Billabong for pairing up Joel Parkinson and Andy Irons in the commentary booth, even if it was for just one heat. The combo of A.I. and Parko was classic and made for some truly golden exchanges. Coming into the 2008 year on the ASP World Tour, Slater’s ever-decreasing board size was already a hot talking point throughout the industry. His segment in Taylor Steele’s Trilogy was a dirty little demonstration on just how ultra-effective and super fun the boards he was riding could be. As the year progressed and Kelly stomped aside the competition, there were very few people, including the surfers on the WCT, who can honestly say they weren’t considering a reduction in board-size in their own quiver. In interviews, video segments, and especially on the water, Kelly Slater was an avid-evangelist for his new design and telling anyone who would listen that shorter was the way to go. When the 2008 Billabong Pipeline Master rolled around, Kelly had long since wrapped up #9 and essentially rendered the back half of the tour as pointless. With the title long since wrapped up, there was speculation as to whether Slater would even make it to Ehukai for his opening heat at the Pipe Masters. Kelly Slater did indeed end up making it to his heat, and fresh from blowing up a swell in the Caroline Islands he went on to do the unthinkable….win the Pipeline Masters while riding a pig-nosed 5′11″ at 6-8 ft. Pipe. While the majority of the surfers were busy riding the standard 6′10″+ guns at Pipe, Slater was introducing us to the “Deep 6″. With the way he surfed the Deep 6, Kelly Slater brought a whole new flavor to Pipeline and once again had everyone throughout the industry peering at one thing and one thing only…his stick. Slater’s taken it to a whole new level in 2009, as he showed up to the recent Quiksilver Pro in Australia with a bag full of boards ranging from 5′4″-5′7″. Before being taken out by Young Gun Julian Wilson in Rd. 3 of the event, Slater, while riding a 5′4″, once again put his hand-crafted design on display for all to see. There was and still is loads of chatter surrounding his choice of equipment circulating throughout. However, right or wrong from a competitive standpoint, he showcased a smooth style of surfing and once again did what any good marketer is supposed to do- get the people talking. Whether he finishes with 9,10,11, or 15 world titles, Kelly Slater is already and will likely be forever known as one of, if not the greatest surfers to ever hit the water. Is the board reduction just an added challenge for someone who has already demonstrated his superiority over the rest of professional surfing? Or has this all been one big marketing campaign for someone looking to bridge the gap between the next phase of his career? Who knows, but either way…you’re reading this, I’m writing this, we’re not the first, we won’t be the last…Kelly Slater must be doing his job. Everyone on the ASP World Tour might want to take notice….Joel Parkinson is a man on a mission. Following an impressive performance at the 2008 version of the Billabong Pipeline Masters, one that saw Parko seal his first ever Triple Crown of Surfing, it’s been reported that Parkinson has been pushing himself to the brink, driven by a roaring hunger to finally win an ASP World Championship. With that being the goal, Parko is off to one hell of a start for 2009 as he surfed almost flawlessly enroute to victory at a thrilling Quiksilver Pro at Snapper Rocks. While it’s just the first event of the year, Parko surfed with an added edge and confidence to his game. Couple that with the fact that the last 3 winners of the inaugural tour stop have gone on to win the overall crown, the rest of the WCT, including Kelly Slater, already has a monumental hill to climb if Joel Parkinson continues to bring what he brought to the Quiksilver Pro at Snapper Rocks. Jordy, Dane, Adriano, and Julian Wilson- You hear it all the time….the WCT is just not going to be that exciting once Slater retires, right? Not even…The young crew of up and comers are bringing an added level of excitement to the ‘CT with an explosive, go for broke approach to the contests that was as exciting as I’ve ever witnessed. Julian boldly dethroned Slater, Dane got swiped of what should have been a huge win over Taj Burrow, and Adriano de Souza went balls to the wall the whole event, culminating in an impressive finals stand against the man to beat, Joel Parkinson. If these guys end up staying on the WCT throughout the upcoming years…. Mick Fanning V. Joel Parkinson- Everyone knew it when these two were paired up in the semifinal…the eventual winner would go on to win it all. With that in mind, the two Coolangatta surfers went on to put up one of the all-time heats as they went head to head in said semifinal, Parko just simply wouldn’t be denied. If you have a few minutes, use a little bit of Google magic and find highlights of this head to head match-up. To use a term that doesn’t get used very often in the world of surfing, it was simply epic. Is it the size that matters, or the motion in the ocean?- We all like to tell ourselves that size doesn’t really matter, but it looks like the judges agree with the chicks…bigger is better. While Kelly Slater struggled in his rd. 3 loss to Julian WIlson, it appeared throughout the contest that the judges were none to impressed with his self-made 5′4″. He was constantly underscored throughout the event. Are the ASP judges sending Slater a message for the rest of the year? Will Mr. 9-time continue to ride his little creations at Bells? Guess we’ll just have to wait and see. The Kirra Effect- The man upstairs might be sending us a message- Bring Kirra Back! In a year that is being dedicated to the restoration of the famed break at Kirra, how crazy is it that the stars aligned and allowed the final rounds of the event to be showcased at it’s current form. It was the first time an ASP World Tour event had been held at the iconic right-hand point break in 12 years, and allowed a perfect opportunity to raise awareness of the battle going on to bring Kirra back to what it once was. And so it begins….If it seems like forever since we’ve had a competitive world championship race to keep tabs on, it’s because we pretty much have. Between Kelly Slater making the 2008 WCT his personal whipping boy and the later than usual start to the 2009 tour, there hasn’t been a whole lot of interest generated by the ‘CT over the past 8 or so months. That’s all about to change. As the holding period for the the 2009 Quiksilver Pro Gold Coast at Snapper Rocks opens today, the 2009 ASP World Tour also gets underway with everyone starting equally at ground zero. To pretend that anything other than Slater’s run for #10 will be the dominating storyline would be asinine. With that in mind, it appears that most have deemed Joel Parkinson as the chosen one to put a wrinkle in King Slater’s plans. Parko’s had a couple of solid runs and 2nd place finishes, but so far just hasn’t quite been able to make it over the hump. With the WCT once again starting off at his home break, Joel Parkinson is fired up and ready to start his 2009 campaign for a world championship. And in regards to Kelly…who knows what he has in store for this year’s version of the WCT. Word is that he’ll likely be surfing a big gun at Snapper, something in the 5′4″-5′6″ range. Whatever he ends up pulling out of his quiver may not really matter though. With a 10th world championship so close that he can almost taste it, Slater already has the competition sized up and is ready to let loose at the Quiksilver Pro. 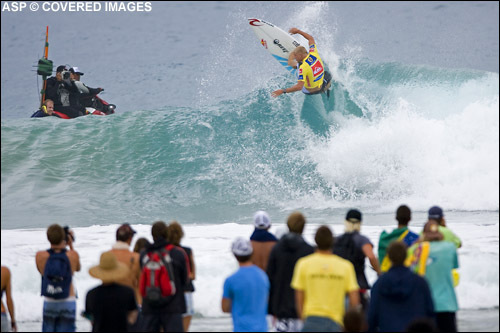 The holding period for the 2009 Quiksilver Pro at Snapper Rocks runs February 28 through March 11, 2009. At this point, it’s no secret that Kelly Slater is making a run at his 10th world title and the rumored $10 million dollar bonus Quiksilver has offered him if he claims it. At this point, I’m not sure how Quik will make good on that offer, but alas. While many of us might rush to the conclusion that Kelly’s #10 is all but in the bank, there’s at least one person that isn’t quite ready to step aside and declare him the ‘09 world champ, yet. Mick Fanning’s making no secret that he’s fired up and ready to duke it out on the waves with The King. In a recent article with Gold Coast, Mick admits that he just wasn’t motivated last year and pretty much rolled over, letting Kelly make him and everyone else look stupid. He’s letting it be known though that the same ‘burning ambition’ that brought him the title in ‘07 is back and he’s looking forward to battling it out with Slates. If Kelly surfs on a completely different level from the rest of the top 44, as he did last year, no amount of words or ambition from Mick, or any of the competitors, will matter. It’s time to start talking about who will win the title in 2010… this year’s already spoken for. While the freesurfing vs. competitive surfing debate has been going on as long as I can remember, 2008 has seen the ongoing contrast of ideas and views on the issue reach a fevered pitch. Bruce Irons deciding to bail on the ASP World Tour, Kelly Slater continuing to establish his unimaginable legacy on that same tour, and Dane Reynolds having a debate with Dane Reynolds on his future with the Dream Tour are just some of the examples of why the freesurfing vs. competitive surfing debate has been especially fresh on our minds in ‘08. In my eyes this debate has always been an easy one. There’s plenty of room in this world for both to thrive. A healthy freesurfing movement allows guy like Dave Rastovich, the Malloy brothers, Jamie O’Brien, and Donavon Frankenreiter to continually blow our minds, each in their own respective way. I really dig the fact that it is becoming more common for the big boys like Billabong and Volcom to sponsor guys and just let them do their thing. I have the sneaking suspicion that we’re going to see truly incredible things from Bruce Irons as the gates of the WCT pen open up and he’s able to roam about the globe and single-handedly progress the sport in ways that only he can. While Bruce goes about his business, the ‘CT will continue on without him. As it does, the storylines and the rich history it produces year after year will go on right with it. This is what makes competitive surfing such a beautiful thing. In fact, the whole motive for this post came as a result of 22 yr. old Michel Bourez’ victory at the first leg of this year’s Vans Triple Crown of Surfing. The Tahitian not only claimed victory with his inspired performance at the Reef Hawaiian Pro, but he also secured a coveted spot on the 2009 Dream Tour with his win at Haleiwa. When you follow surfing, it can be easy to forget the real life aspects that take place with the surfers who have battled to get to where they are at today. Competitive surfing is full of inspiring stories of hard work, dedication, perseverance, broken hearts, and the realization of dreams. In the euphoric days following the Reef Hawaiian Pro, Michel Bourez told his story in his own words. In doing so, he once again reminded myself, as well as thousands of others, what it is that makes the world tour and competitive surfing so special. So as far as the competitive surfing vs. freesurfing debate goes, it’s pretty simple….there’s plenty of room in my world for both. 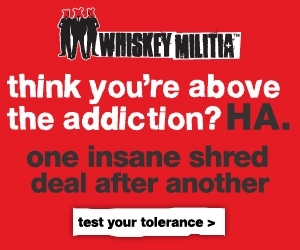 Hopefully this is the case for you as well. Both aspects of surfing are full of stories, images, history and so much more, all of which you don’t want to miss. The list of surfers vying for a win in opening leg of the Van’s Triple Crown of Surfing is being whittled down. At the moment, the Reef Hawaiian Pro is currently in the 4th round of action in a pretty fun looking 3-4 ft. swell at Haleiwa. For the most part the top surfers coming into the event have held their ground. Taj Burrow, Joel Parkinson, and Bede Durbidge are the remaining surfers from the WCT Top 10. Both Mick Fanning and C.J. Hobgood got clipped early on in the 4th. Defending champion Roy Powers is on top of his game again at Haleiwa and looking like he intends on going back to back. With the first jewel in the Triple Crown and end of season WQS points on the line, the competition is sure to intensify as the event winds down. Be sure to catch the webcast as we get into the business end of the competition. Here are just three of the lessons learned from time spent living in Nicaragua- Actually being able to flush toilet paper in a toilet is a privilege, endless offshore winds and Nica walk hand in hand to create some of the most enjoyable surfing in the world, and there is a new breed of German surfer who is as truly stoked and passionate as surfing as any I’ve ever come across. Over the past several years, the evidence of the rapid growth seen by sufing in Europe has been everywhere from the numbers of Euro-based surf travelers all the way to the increased contingent of Euro’s on the ASP World Tour. That contingent will be even larger and more diverse in 2009 as Marlon Lipke currently finds himself in a solid position to become the first ever German on the WCT. Hovering around the ‘CT cut-off, Lipke came up big in Portugal by making the quarterfinals at the Estoril Coast Pro recently. By making the quarters, Marlon collected 1625 vital points and with a total of 11450 now sits in 9th on the WQS ratings with the two last big events in Hawaii to go. Being the first German to make the WCT isn’t exactly Barack Obama status on the barrier-breaking scale, but a surfer from a land-locked country joining the Top 44 is a pretty crazy notion and just goes to show how much surfing is catching on all over the world. More than anything, the passion and dedication to surfing held by the majority of German-shredders I’ve met has simply been remarkable. Regardless of their skill level, they always seem to be the first and last in the water, pushing themselves and making the most out of every session. It’s a beautiful thing to see and we there is no doubt that, although he may end up being the first, Marlon Lipke will not be the last German surfer to make a little bit of noise in the surfing world. With the Billabong Pipeline Masters being all that remains in the 2008 ASP World Tour, one that saw the world title essentially locked up coming out of the Australian leg, the 2009 Dream Tour is already starting to take shape. Who will be there? Many of the spots have already been locked up and Hawaii will resolve the rest over the next few weeks. Where will the events take place? The ASP handled that bit today by releasing their 2009 WCT schedule. While much of the tour remains the same, there are a couple of noticeable differences on tap for ‘09. The Brazil event has (thank god) been moved up to June. After the mess that was this years Hang Loose Santa Catarina Pro, and the overall disinterest in the event in general, a change was needed. Who knows if this move will actually make a difference, but anything is better than what it has been. The other change is the removal of the Globe Pro Fiji. No motive was given for the omission from 2009, but while the event saw incredible surf this year it seems that the political climate and logistics of running the event in Fiji have apparently proved themselves as too much to overcome.